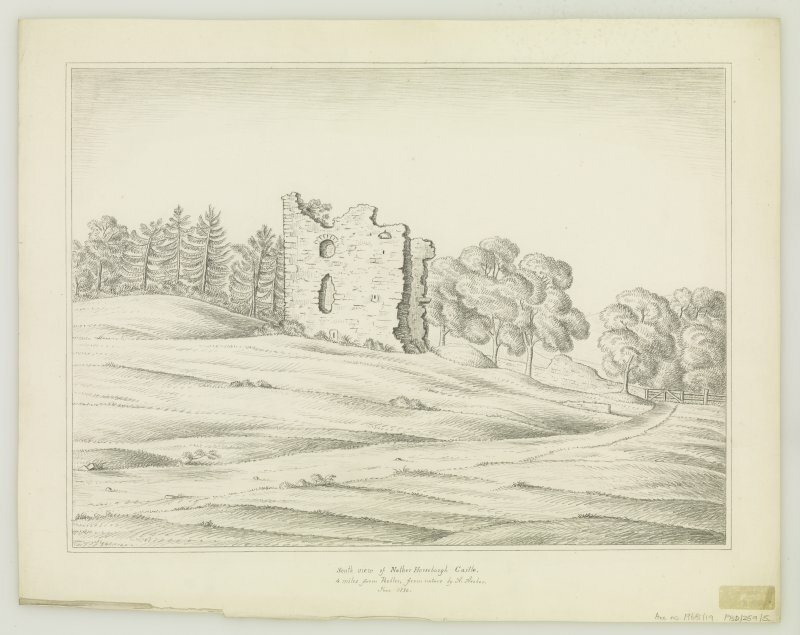 Oblique aerial view of Nether Horsburgh Castle, taken from the SE. 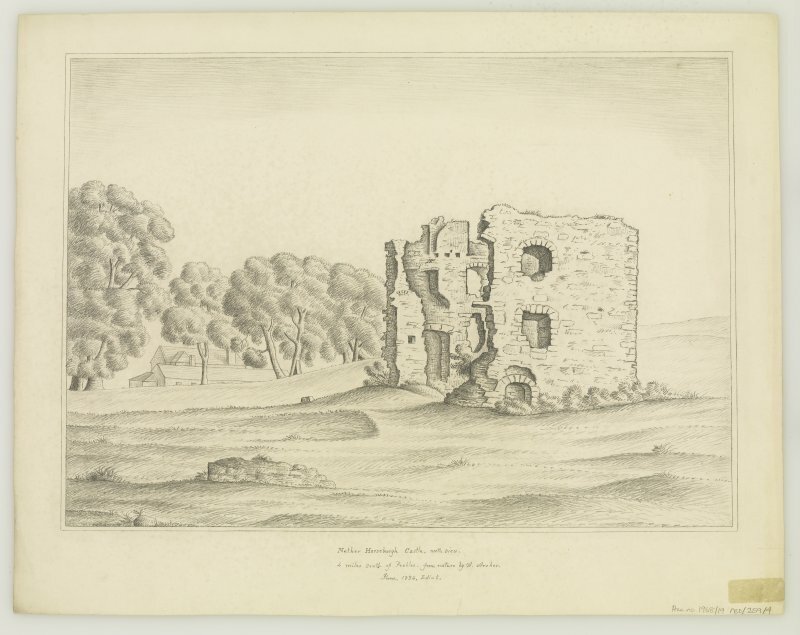 Oblique aerial view of Nether Horsburgh Castle, taken from the S.
Scanned image of view from SE. 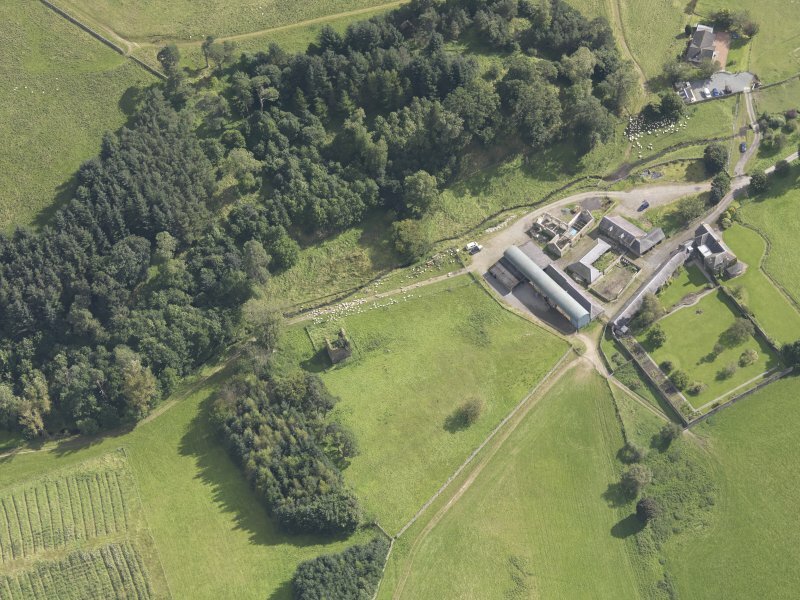 Oblique aerial view of Nether Horsburgh Castle, taken from the WNW. 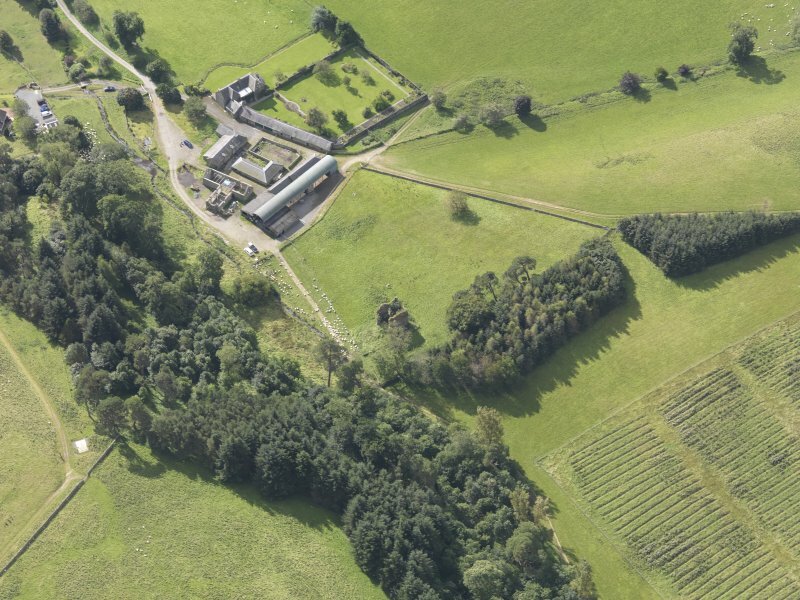 Oblique aerial view of Nether Horsburgh Castle, taken from the NE. 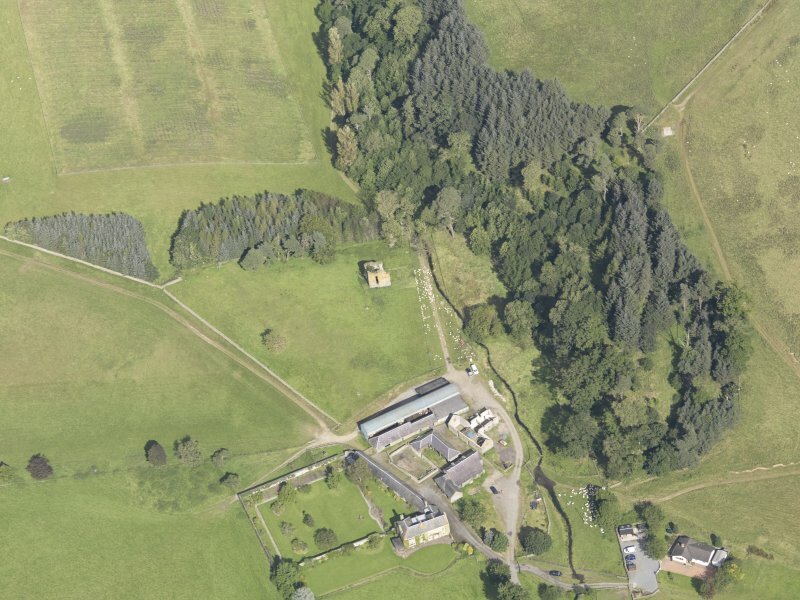 Oblique aerial view of Nether Horsburgh Castle, taken from the WSW. 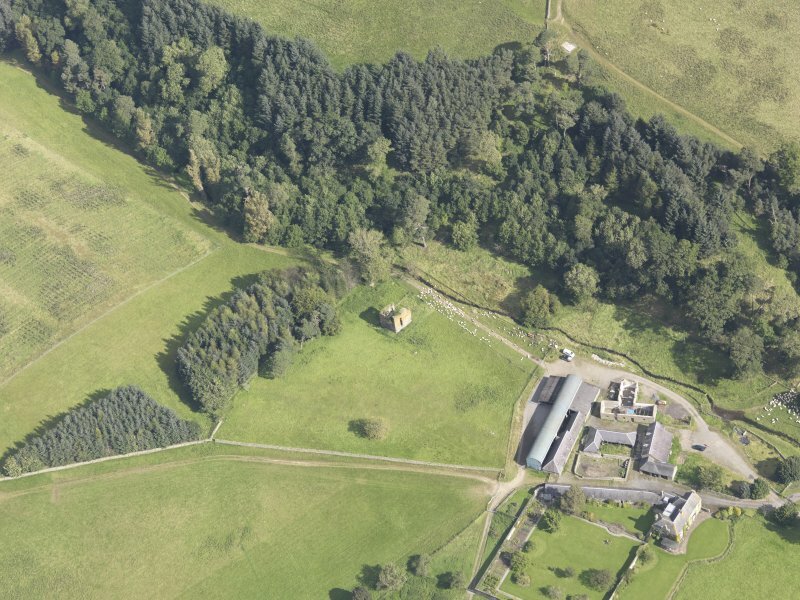 Oblique aerial view of Nether Horsburgh Castle, taken from the N.
Nether Horsburgh Castle, a little oblong 16th. 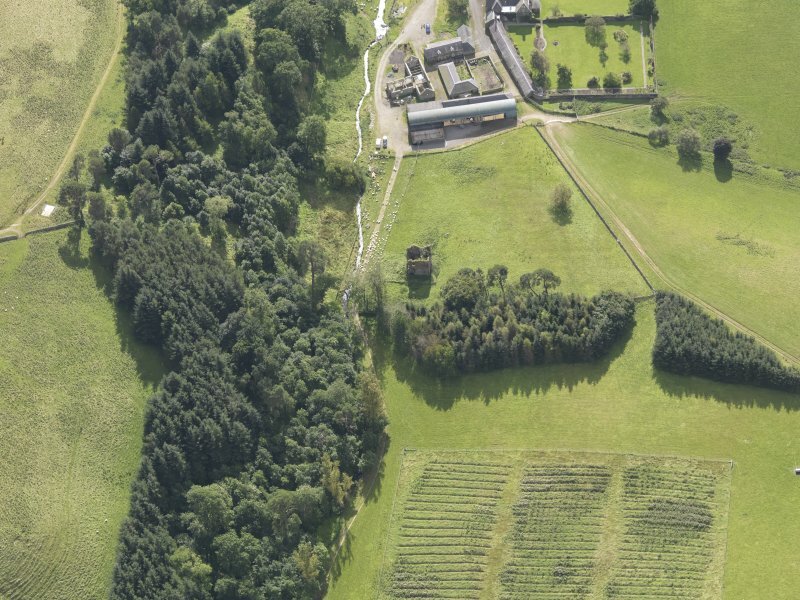 century tower-house is set in a secluded valley, on low ground within 50' of the Hope Burn. The E end of the tower, facing the stream, has been demolished, but the line of the E wall was established in a trial trench excavated by the Commission's officers at the date of visit. 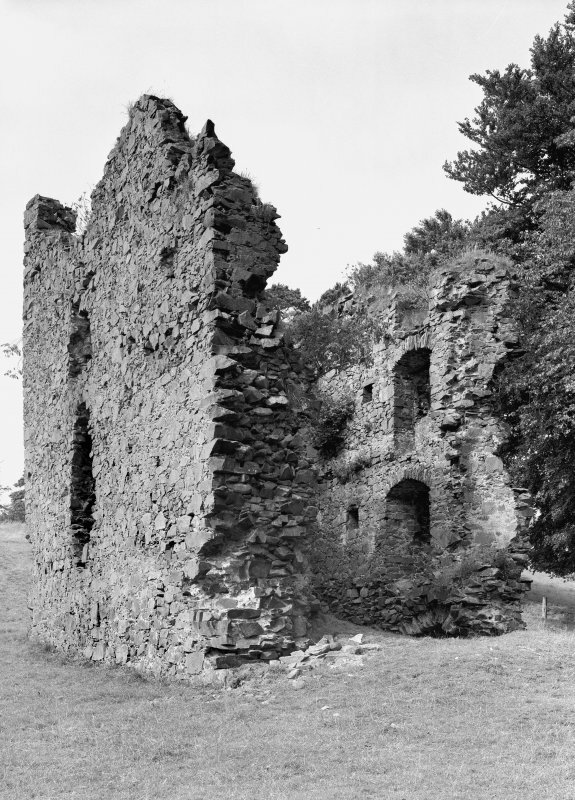 The three other walls still stand to a height of about 40', but they are very ruinous, the dressings having all been torn away from the whinstone rubble-masonry, which at best was not of good quality. The tower appears to have measured 32'2" by 26'3" over walls 4'2" thick, and rose to a height of at least four storeys. The entrance doorway, situated at ground-floor level towards the E end of the N wall, led into a barrel- vaulted apartment lit by slit-windows, to W and S. There is some evidence to suggest that access to the first floor was obtained by means of a straight stair ascending in the thickness of the E gable-wall. A contemporary range of two-storeyed buildings evidently extended eastwards for a distance of about 45ft. from the east wall of the tower: it has now completely disappeared but the broken tusking of its S wall can be seen at the SE angle of the tower. From the E end of this range, and at right angles to it, a second range of buildings appears to have extended northwards for a distance of about 72ft. Of this range, only a fragment of the N gable-wall now survives, being incorporated in a dyke which at this point forms the northern boundary of the field in which the tower stands. The surviving fragment of wall has a thickness of 3ft. and rises to a maximum height of 8ft; it shows evidence for existence of a small window and of an aumbry. No doubt further ranges of buildings, or or enclosing walls, once returned northwards and then westwards to form a courtyard on the N side of the tower. This tower is as described. Visited by OS (EGC) 20 June 1961 and (SFS) 6 June 1974. 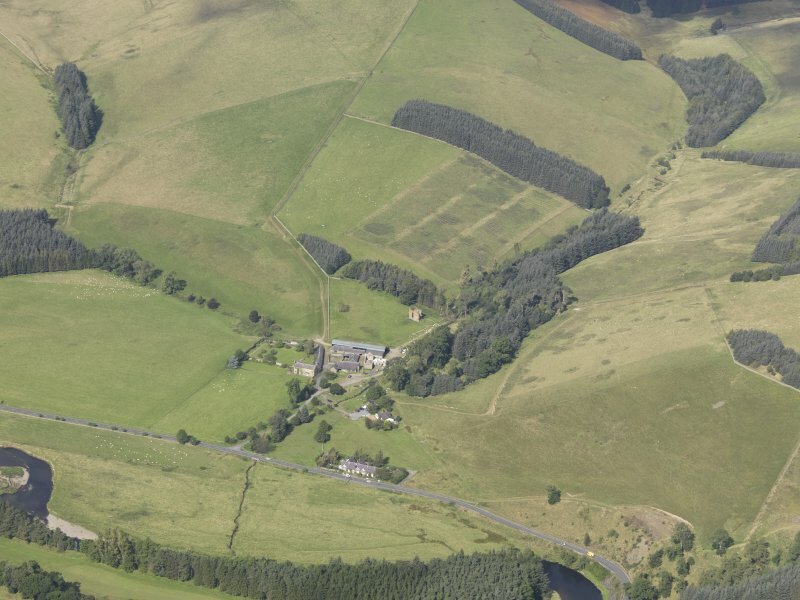 The Forestry Commission commissioned AOC Archaeology Group to undertake an historic buildings survey of Nether Horsburgh Tower in Innerleithen in the Scottish Borders in advance of a wider programme of consolidation and repair work on the building, which is a Scheduled Ancient Monument. Nether Horsburgh Tower - not to be confused with Horsburgh Tower or Castle a few miles to the west - dates back to the mid-late 16th century, possibly the early 17th century, and is thought to have either been constructed by the Horsburgh family or later the Stewarts of Schillinglaw, who purchased the lands of Nether Horsburgh in the early 17th century. It is not known exactly when the tower was abandoned, although it now stands as a complete roofless ruin, with only three walls standing and the ground floor, which once would have had a stone vaulted roof, completely collapsed in. The ground level of around the tower has also been built up considerably, although immediately to the north-east are the remains of a much wider settlement around the castle. 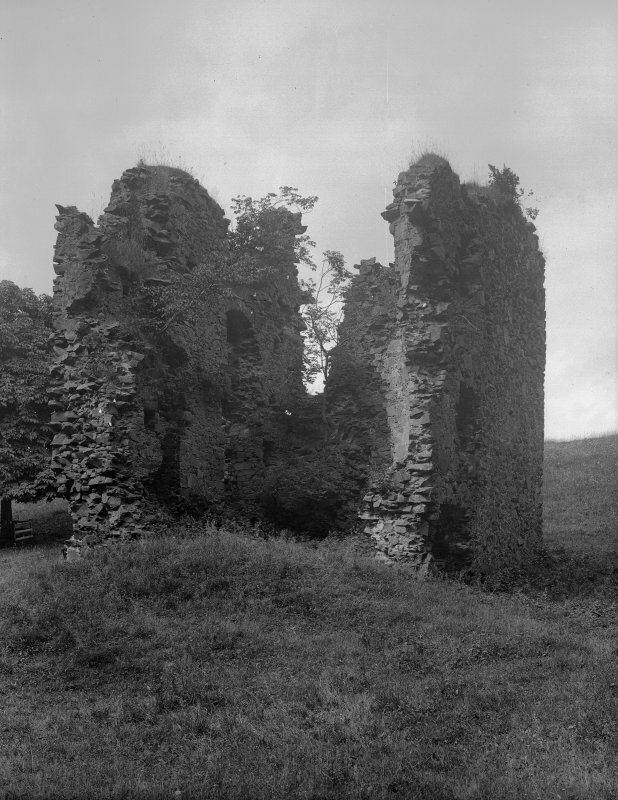 A further extension of the castle is also believed to have extended further to the east, as can be seen in the east wall to the south, where the wall has collapsed. The Level 4 survey included a programme of detailed archive research, written and photographic record together with a 3D scan of the tower producing 2D plans, elevations and sections and 3D flythroughs. This is a 4 storey 16th century tower house. 3 walls of the tower are still standing to a height of c.12m, but they are in ruinous condition. The dressings have been torn away from the bad quality whinstone rubble masonry. Small fragments of a range of outbuildings extending east then north of the tower (01) can beseen here. There are probably contemporary with the tower. There are probably more on the west of the tower and probably formed a courtyard with those to the north and the east.